TIP: Aromatics that go well with a savoury herb brined turkey: onions, celery, and carrots. Aromatics that go well with a citrus ginger brined turkey: onion, orange or other citrus fruits like grapefruit or lemon, cranberries, and apples. In a stock pot over high heat, combine all of the brine ingredients, except for the ice water (don’t put in ingredients listed under aromatics either, that’s to stuff your turkey with later on). Bring to a boil, then reduce heat to a simmer, stirring until salt and sugar has dissolved. Remove from heat and allow brine to cool. You can put your brine in the fridge to speed up this process. 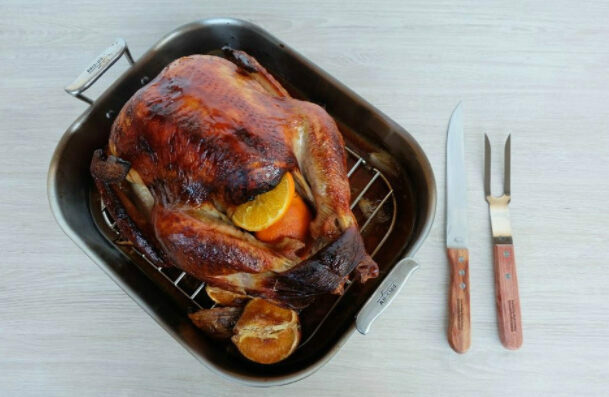 If you aren’t brining your turkey immediately, store your brine in the fridge covered for up to a week. Once brine is cooled, remove giblets from turkey and set aside. 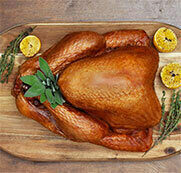 Place turkey in a container large enough to hold the entire turkey, brine and ice water. Pour in brine and then enough ice water to cover the entire turkey. Put in fridge if possible, otherwise in a cool dark place for 8-48 hours. If you don’t have room in your fridge we suggest packing ice packs around the container that you are brining your turkey in to make sure it stays nice and cool. Preheat oven 475°F and arrange oven rack to the lowest position. Remove turkey from brine, discarding brine liquid. Rinse turkey with cold water and then pat dry with a paper towel. Place turkey breast side up on a roasting rack in a roasting pan. If necessary, use some of your aromatics to help keep the turkey level and balanced. Rub the bird down inside and out with butter coating entire surface. Place aromatics in and around your turkey. Placing them in the turkey cavity and neck opening. Tuck wings under turkey or cover tips with tin foil to prevent them from burning. Secure legs under skin flap if possible or tie with butchers twine. Put turkey in oven for 30 minutes. Check turkey and tent it with tin foil if necessary to prevent skin from burning. Reduce heat to 350F. Roast until temperature in the thigh and breast read 170F. A turkey between 12 and 16 pounds should take approximately 2 1/2 to 3 hours to cook. Remove turkey and let rest under tin foil for at least 15 min before carving. Serve and enjoy.